1 Pair of Socks: $8.956-11 Pair: $8.75 ea.12 and up: $8.50 ea. ECLIPSE TIE DYE SOCKS ... These Red Lion Brand black & multi-color Over the Calf Tie-Dye Tube Socks are available in popular school or team colors and are great fun to wear anywhere. Please Note: There will be some color-bleeding and/or color variation from the tie-dye process, so not all socks will look exactly like the photos above, and no two pair of socks will look exactly the same. Some socks won't have any white spots at all, and will be completely tie dyed. 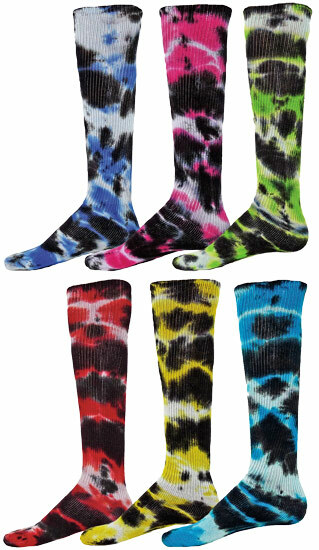 Eclipse Tye-Dyed Tube Sock Material: 88% Cotton, 11% Nylon and 1% Spandex. Care Instructions: Due to the dying method of these Tye-Dye Tube Socks Socks - Hand Washing is highly recommended. � Royal Blue and Black, � Neon Pink and Black, � Neon Lime Green and Black, � Red and Black, � Gold and Black, � Neon Blue and Black. * * You can Mix & Match Colors & Sizes to get Quantity Prices! 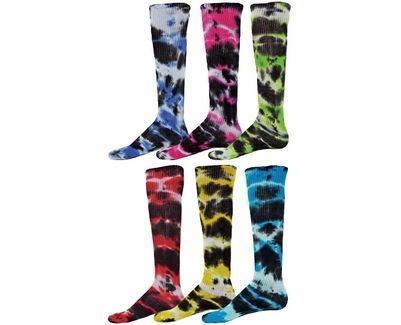 These very Colorful & Fun Tie Dyed tube socks can be worn while playing many Sports: Volleyball, Soccer, Basketball, Softball, Cheer, Dance, Lacrosse, Baseball, Football, Running, etc... so make sure to buy enough for the whole team. PLEASE NOTE: Due to the Dying Process - no two socks will look exactly alike, and they may look darker than the photos shown and have less white spots because the Ink Dyes may Bleed or include traces of the 2 Ink Colors used to create the colored sock... For Instance: the Black Tie-Dye portions may have shades of Dark Navy Blue or Brown coloring. My youth volleyball team loves their new socks, matching their black and gold uniforms. My favorite comment was, "they remind me of rotten bananas!" Fit is great, and the girls claim no problems with the socks staying up. I bought these socks for my 8u softball team as a second pair to wear. The girls loved them and wanted to wear these every game in replacement to there solid socks. Perfect fit and comfortable. This company bent over backwards to get this order right!! After a color variation issue they quickly shipped us out more right in time for our sporting event!! They are awesome!! The socks were a HIT! Easy ordering, delivery quick, happy ball players. I've ordered from this company the last 2 years and everything has been great! While there was a disclaimer that stated the tie dye would not all be the same for every pair, that was fine. However the socks we got are all basically blue with black and hardly any white. Our team picked this style due to the 3 color combo and we did not get that. Also socks were a little tough and needed a wash to soften up. Fast service and shipping though and socks did fit. As advertised and arrived quickly. Exactly what I needed. Arrived quickly. Should have bought more! My daughter's teammates want a pair too! quality product and super cute! Socks arrived quickly and no problems with the order. Our team was pink thunder and the tie dye look made a perfect match for our team name! My daughter's gymnastics team loved their tie-dye socks. Now everyone at her gym wants to know where we got them. The socks shipped as expected and fit as expected. Thanks! I ordered these socks for my soccer team and they love them!